Philip Rivers is back in the playoffs for the first time in five years and he's not about to judge the quality of the latest one, a hard-fought 23-9 win Sunday over the scrappy Denver Broncos. 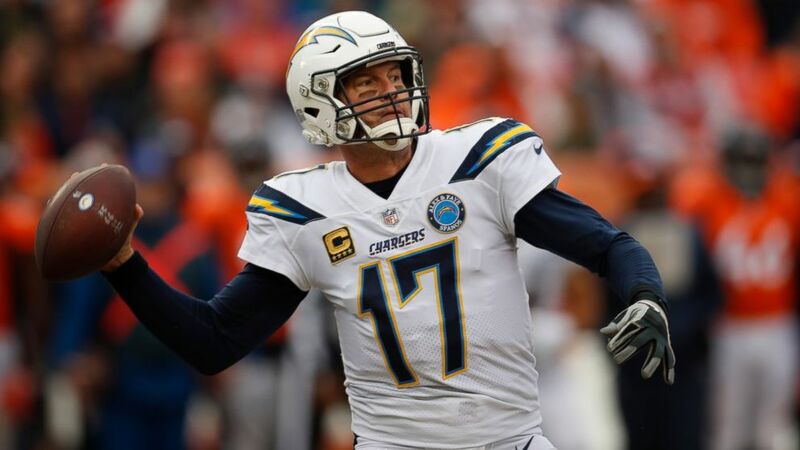 "It's hard to win 12 games," Rivers said after accomplishing the feat for just the third time in his 15-year NFL career and for the first time since 2009. Were it not for a last-second loss to the Broncos at home in November, the Chargers would have supplanted the Chiefs as the No. 1 seed in the AFC playoffs. Instead, they'll go in as a wild-card next weekend and visit Baltimore. They were thumped by the Ravens 22-10 last week at home. "It's a heck of a challenge," Rivers said. "I don't there was a team that wasn't going to be a heck of a challenge. ... They're all good. That team outplayed us last week and it will be a new game, new everything. We'll see who can play the best this time." The Broncos (6-10) careened into an offseason of uncertainty after posting double-digit losses in consecutive seasons for the first time since 1966-67, an ignominy that could cost second-year coach Vance Joseph his job. "I want to come back and make this thing right," said Joseph, who's expected to meet with general manager John Elway on Monday morning. "V.J., he's one of my favorite people on this planet. I love that guy with all my heart and I've got a lot of respect for him," Wolfe said. Rivers was just 14 of 34 for 176 yards and a touchdown and he threw two interceptions in the first quarter, something that's happened just twice before in Rivers' 15-year NFL career. Denver pulled to 14-9 on fullback Andy Janovich's 20-yard touchdown grab in the fourth quarter, the first TD of his career. Case Keenum's 2-point conversion throw, however, was picked off by cornerback Casey Hayward Jr., who slipped a tackle attempt by receiver Courtland Sutton at the left pylon and rumbled 102 yards for a pick-2 that gave Los Angeles a 16-9 lead with 10:10 remaining. Then, Rivers had his only sustained drive, capped by Austin Ekeler's 1-yard TD run. The Chargers took a 7-3 halftime lead thanks to a defensive touchdown . Rivers' 3-yard TD toss to Mike Williams that made it 14-3 came after Joey Bosa's fumble recovery at the Denver 16. Broncos offensive coordinator Bill Musgrave's script proved ineffective again — for the ninth straight week, Denver punted on its opening drive. The Chargers' only first-half score came when Keenum hit Royce Freeman with a low screen that was ruled a backward pass. Freeman didn't secure it and a hard hit by cornerback Desmond King II to a prone Freeman popped the ball loose. The Broncos reached the 6, but had to settle for Brandon McManus' 28-yard field goal. Chargers: LB Jatavis Brown injured his right ankle tackling Royce Freeman on the final play of the first quarter.